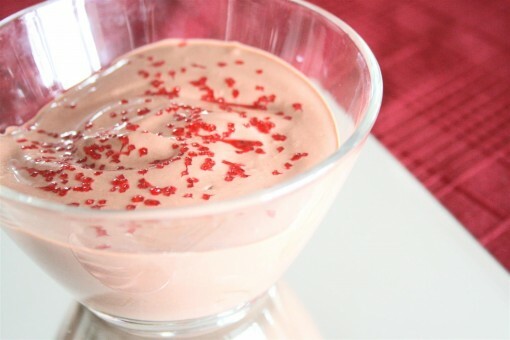 Vegan Valentine Chocolate Pudding was posted on February 12th, 2011 and is filed under Dairy Free, Desserts, Gluten Free, Kid Friendly, Recipes, Vegan. This entry has 6 comments. You can follow any responses through the RSS 2.0 Comment Feed. I want to because of my deep love for chocolate. When I made up the recipe I was craving chocolate. Because being single on Valentine’s Day means I need an extra helping of chocolate. Puddings are one of my most cherished desserts, but most recipes call for milk or cream. I don’t eat dairy; so of course, I have to remedy this formidable situation. And as everyone knows, true love always finds the way. Just because something is vegan doesn’t mean it isn’t creamy; especially with this recipe. This recipe has a hefty dose of vegetarian protein, your healthy fats, antioxidants from the dark cocoa, and is completely plant based. That’s the way I like to do dessert! This recipe makes two servings, but if you’re like me and don’t have anyone to share Valentine Day’s dessert with, you ignore that last statement and eat both halves. Twizzle up in your blender. Pour into two pretty bowls. Garnish with chocolate shavings or red sprinkles. Proceed to lick out blender. There are a few variations you could do with this recipe…the one I would’ve done (if I had some milk-free chocolate chips on hand) would be to whirl up a handful of chocolate pieces for a few seconds after the rest was blended. I like chunky bits of chocolate. Duh. It’s chocolate. This morning started with a 20 minute Biggest Loser workout (loooove these workouts!) and then I followed it up with a vegan, blueberry protein shake. There are no words to describe how refreshing it is to have a cold smoothie after a good cardio session. For lunch I had a big salad with crab meat and avocado dressed with seasoned rice vinegar, Bragg’s soya sauce, and 1 tsp. olive oil. I really enjoyed the dressing…it was low calorie, raw, healthy, easy and delicious. It went perfect with the seafood taste of crab meat and neutral, smooth flavours of the avocado. Happy Valentines everybody! Hope your day is very special! What kind of simple, homemade dressings do you like to whip up? And what are you doing for Valentines? This is incredible! I actually love using sweetened, silky tofu to make puddings. My fave is chocolate but this one looks amazing. Will have to post my recipe on my blog sometime. Tofu pudding rocks! This looks delicious! I will definitely have to make this in the very near future :) I want to try out the biggest loser workouts, I have the 30 day shred but only did it a couple of times lol need to get on that. The pudding looks lovely! But how did you manage to make it look pink? I mean my cacao powder is chocolaty brown, are there different kinds of cocoa / cacao? i like making a basic balsamic dressing,never gets old: dijon mustard, honey, balsamic, and olive oil. sorry i’m commenting again…i just noticed your reading the book nourishing traditions….let me just comment that, i love that book with a passion. :) i like to say it’s my kitchen’s bible….how do you like it??? Teenagehealthfreak- Thank you so much! I really have enjoyed Nourishing Traditions. I’m reading through it like a book, so I haven’t actually tried a ton of recipes from it. Do you make a lot of the recipes? If so, I’d love to hear what you think of them. Jen- I heart tofu puddings! Seriously, it sounds odd, but it makes it so creamy! Let me know when you post your recipe! I want to see it! Jackie- Oh, I love the 30 day shred! It’s a killer…but soooo worth it!